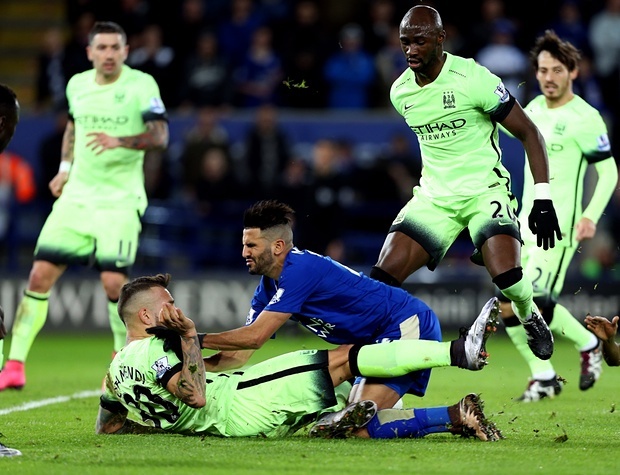 Would Manchester City Be Satisfied With Drawing Against Leicester City? Manchester City failed to overtake Leicester City in the Barclays Premier League table, as they played out a goalless draw at the King Power Stadium yesterday. The visitors went into the game with the possibility of taking second spot behind leaders Arsenal, but had to settle for a point in the end. City have finished with 36 points – 3 points behind the Gunners and Foxes, who hold the first and second positions respectively – at the end of the first leg of Premier League fixtures. In hindsight, was it a point gained or two points dropped for Manuel Pellegrini’s side? The nature of the game was such that it is hard to say if Leicester held the Cityzens, or the other way around. Though the final scoreline was 0-0, it was an entertaining game nonetheless. City started brightly, just as they did against Arsenal before Christmas, and carved out a handful of chances during the first half. Raheem Sterling, playing alongside Sergio Aguero upfront, made intelligent runs behind the Leicester defence and proved a menace to Kasper Schmeichel’s goal. As a team, though, City did not make the most of those moments, and rarely came close to breaching the Leicester goalkeeper. Defensively, City did well to keep Riyad Mahrez and Jamie Vardy, who between them have scored 28 of their team’s 37 league goals, under leash and the duo never got into the game at any stage. Pellegrini’s men also managed to keep a cleansheet for the first time without their inspirational skipper in Vincent Kompany, who is likely to be out for another month due to the recurrence of the calf injury. Yes, there were a few moments when City’s rearguard was not composed enough and committed mistakes that, on another day, could have proven fatal, like Eliaquim Mangala’s ridiculous give-away against the Gunners did last Monday night. Fernandinho too, was lucky to get away with a mistake towards the end of the first half, with Vardy failing to capitalize on the error. Overall, though, City were defensively good against a team that has scored the same number of goals (37, the joint-highest) as they have so far in the league this season. If you go by the statistics, merely, of yesterday’s game, City were the superior of the two sides. They created more chances, 15 to Leicester’s 8, registered more shots, 21 to 11, and enjoyed a lot more possession than the Foxes: 61% to 39%. But, as aforementioned, they did not put the Leicester defence and their goalkeeper under sustained and enough pressure. One of the reasons for that was the way the home side setup. They were happy to let City have the ball, but remained well organized in a narrow 4-3-3 formation. Because Leicester were so narrow, City were forced out wide on many occasions, resulting in them putting in a whopping 39 crosses compared to home side’s 17. Bacary Sagna and Aleksandar Kolarov played critical roles in giving City width, delivering incisive crosses more often than not and creating 5 chances from their combined 12 crossing attempts. In an attacking sense, City’s key players failed to turn up. The likes of Kevin de Bruyne, Yaya Toure and David Silva had ordinary games by their lofty standards, and did not quite give City the cutting edge they needed against a vehement Leicester side. Aguero too, on his return to the starting lineup, looked rusty and was not up to scratch, failing to keep any of his five attempts on target. The Argentine was felled by Gokhan Inler in the 18-yard box in the second half, and Aguero’s appeal for a penalty was not unreasonable. But referee Craig Pawson and his assistants were not too interested in the claim. Replays clearly showed Inler making contact with Aguero and tripping him up, without getting a touch on the ball. Pellegrini’s substitutions, Wilfried Bony, Jesus Navas and Kelechi Iheanacho, did not improve City’s attacking threat even in the slightest. The marquee aspect of City’s 0-0 draw against Leicester was the way they blunted the dynamic Vardy and Mahrez duo, and thereby limiting the home side’s attacking threat. However, going forward, City were not even half as incisive as against Sunderland, contending with the fact that the Foxes are a much better defensive side, as well, than the Black Cats. Considering all the factors from yesterday’s game, City should see it as a point gained and continue improving on their performances away from home.